When it comes to hot dogs, more than a few people turn up their noses. Which is completely understandable if we’re talking about boring, pedestrian hot dogs. 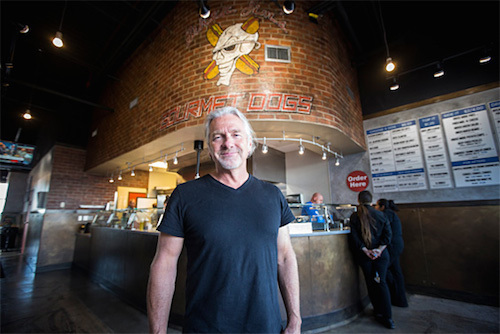 However, if you’ve ever swooned over a Biker Jim’s gourmet hot dog (of Food Network fame), you’re going to be delighted to know his famous dogs have found a home in Highlands Ranch. Opened earlier this month, Biker Jim’s Gourmet Dogs is located at 1601 Mayberry Drive near Crave and Indulge Wine Bar, and, fittingly, in the former site of Bernie’s Hot Dogs. Hailed as Denver’s best hot dog by Westword, and one of the country’s best according to Food and Wine, Forbes, and the Food Channel, Biker Jim’s began humbly with former repo man, Jim Pittenger, selling hot dogs from a cart on the 16th Street Mall. These were no ordinary dogs, though, as they were split, slathered with cream cheese and heaped with strangely irresistible onions soaked in Coca-Cola. 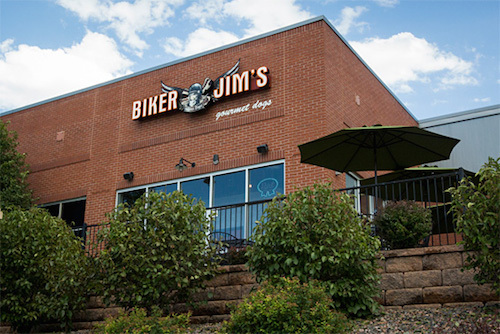 Biker Jim’s growing fame led to a shop on Larimer Street (still thriving, as is the cart), and now the Highlands Ranch restaurant, with 30 seats and great mountain views. What’s created his rabidly loyal fan base? Quality ingredients with unexpected flavors. Dogs include Louisiana Red Hots, Wild Boar Sausage, Alaska Reindeer, and Elk Jalapeno Cheddar Brats. One savory flavor combo, The Conspiracy, includes Stilton blue cheese, bacon, red onion marmalade, and French fried onions. And house-made sides like French fries, fried macaroni and cheese, and fried pickles round things out…so to speak. Hungry yet? Visit Biker Jim’s Sunday-Thursday from 11 a.m. to 9 p.m. and 11 a.m. to 10 p.m. on Friday and Saturday.